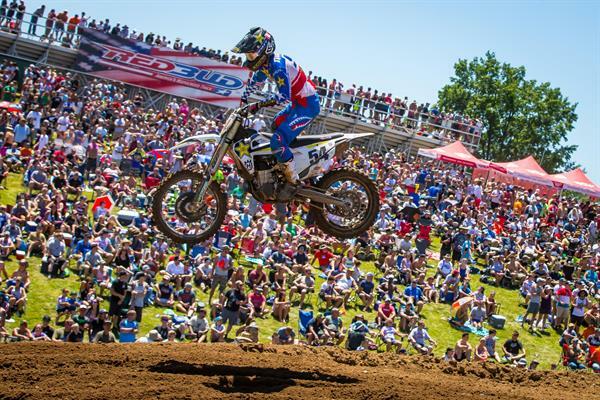 The Rockstar Energy Husqvarna Factory Racing Team went to battle at the historic RedBud National, the seventh round of the AMA Pro Motocross Championship, in Buchanan, Mich. on Saturday. The team had a strong showing, with Phil Nicoletti earning fifth in the 450 class, and Michael Mosiman, Mitchell Harrison, Jordan Bailey, and Ryan Sipes finishing eighth, 10th, 12th, and 16th, respectively, in the 250 class. Phil Nicoletti got a great start in the first 450 moto and quickly moved into third. He inherited the second-place spot after the leader went down, then went back to third the following lap. He fought hard for position and looked strong as he charged his way through the moto. He put on an impressive ride despite being shuffled back and crossed the finish line in sixth. He was mid-pack at the start of the second moto and came out of the first lap in eighth. He charged to sixth in the second lap and put on a strong ride to finish sixth. He went 6-6 for an impressive fifth overall on the day. Michael Mosiman was mid-pack at the start of the first 250 moto and was riding in 14th by the second lap. He charged his way to 11th by the fifth lap, then continued to push as he made his way into the top-10 with eight minutes remaining. He held his ground and finished ninth despite going down twice in the race. He got a great start in the second moto and came out of the first lap in fourth. He was shuffled back to 12th then made one more pass to finish just outside the top-10 in 11th. He went 9-11 for eighth overall on the day. Mitchell Harrison went down at the start of the first 250 moto and had to work his way through the field. He was in 17th in lap 10 then made a late race charge to finish 13th despite crashing three times during the race. He pulled the holeshot in the second moto but got shuffled back to sixth by the end of the first lap. He was eighth around the halfway mark and stayed strong to finish eighth. The 13-18 finish gave him 10th overall on the day. Jordan Bailey was mid-pack at the start of the first 250 moto and was just outside of the top-10 in the second lap. He held strong in 11th the majority of the race before finishing 12th. He was mid-pack at the start of the second moto and was riding strong in 12th. He moved up to 11th soon after then made two more passes for ninth after the halfway point. He put on a great ride and made one more pass to finish 10th. He finished 12-10 for 12th overall. Ryan Sipes joined the team as a fill-in rider this week, and held his ground amongst the stacked field. He got a decent start in the first 250 moto and came out of the first lap mid-pack. He stayed consistent the remainder of the race to finish 16th. He got a good start in the second moto and was eighth by the end of the first lap, then put on a strong ride and finished 13th. The 16-13 finish gave him 16th overall.